December has rolled around really quickly this year! I feel like time has flown by and now I am semi-scrambling to sort out my life before the end of the year. One thing that happens a lot at this time of year are all the holiday charity campaigns and I struggle to decide where I can donate my money and time when both are quite limited – this year more than most. 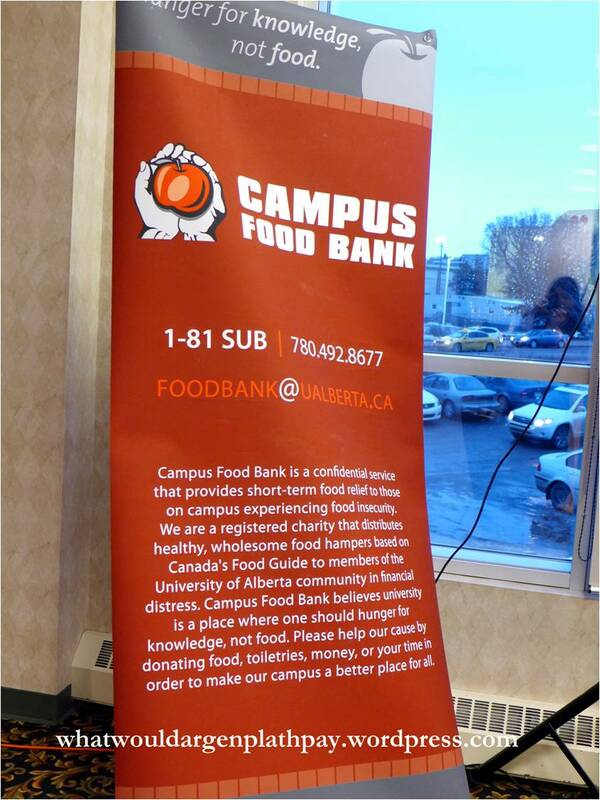 The Edmonton Food Bank and Campus Food Bank are two organizations that are really important to me, because people shouldn’t have to decide between basic needs like shelter and food, so I appreciate the support that organizations like these contribute to the community. Ideally, I would love to see people not need these services, but until that time, I try to donate whatever I can to both organizations. With the Alberta economy taking such a huge hit with the decline in oil prices, I know that many organizations need as much help as they can get to ensure that they can help as many people as possible. I have lived in Edmonton all my life and every year I hear about The Edmonton Singing Christmas Tree and year after year, I never go. Well that is all about to change because this year I will be able to attend on opening night! I was completely clueless about what The Edmonton Singing Christmas Tree was all about – I just assumed that it was a choral concert where people sing while standing on a gigantic tree. Wow, was I ever wrong (this is a pretty much going to be a theme for this post) – The Edmonton Singing Christmas Tree Foundation is an amazing organization that works to support the Edmonton community in many different ways. For example, this year, The Edmonton Singing Christmas Tree Foundation made $50,000 donations to the Edmonton Food Bank and Santa’s Anonymous and also donated musical instruments to three elementary schools. The Edmonton Singing Christmas Tree Foundation wants to bring Christmas all year round to children in need through gifts, food, and music education, which I think is an incredible mission. With November coming to an end, I find my holiday season starting to ramp up with events and all sorts of craziness, but I love December anyways because of this super amazing energy that everyone has as they start getting ready for the holidays. While I would advocate for giving of time and yourself throughout the entire year, I know a lot of people (including myself) need that nudge the holidays provide to remember to give and be kind to others. And on that note, I would like to share with y’all an initiative coming from Edo Japan. What Edo Japan is doing is sending Edo Japan Elves out and about in the Edmonton area to provide random acts of kindness between Nov 28 – Dec 21. The Edo Japan Elves will be surprising Edmontonians by performing good deeds all around the city in hopes of making the holidays a little brighter! Last week, I attended the 5th Annual Campus Food Bank Mac n Cheese Affair with A, Andrea, JP and Teresa. The Mac n Cheese Affair is a fundraiser for the campus food bank (CFB) and I really believe in supporting them because they do such amazing work for the University community. The speeches really highlighted the various types of people they help, it’s not just students, but also staff and alumni. Food insecurity is such a major issue these days and it’s heartbreaking to hear of how people have to make a choice between food and other basic necessities, so having an organization like the CFB to give members of the University community a helping hand is beyond important and I was happy to attend the Mac n Cheese Affair for such a great cause.